Teeth Jewellery is a new addition to cosmetic dentistry to help you add a sparkle to your pearly whites. You can now have a golden tooth, a twinkle of red stones and rubies, or an aquamarine blue stone shine on your tooth. Tooth accessories are a great way to lock your hands with fashion, and they also add vigour to your appearance. Use of teeth jewellery and the procedures for applying it are completely safe! It is a 15-minute procedure very similar to orthodontic brackets (Braces), and the design is bonded to the structure of your tooth. You can either have these teeth jewellery removed or replaced as per your convenience and preferences. Getting tooth accessories done, usually does not involve any drilling, which makes it much easier to be directly bonded to the surface of the tooth. It doesn’t harm your teeth and is completely pain-free! Teeth Jewellery is now trending world over and has entered India as well. Teeth jewellery is an elegant addition to complement regular jewellery that we use. Teeth jewellery enhances and brings out a distinctive expression of an individual’s personality. 1. Twinkles: This is a collection of 24-carat gold and white gold jewellery. This type of teeth jewellery is available in over 50 different designs with some including diamonds, sapphires and ruby. 2. Dental Gems: Dental Gems are a range of glass crystals are available in nine different colours – diamond, rainbow, ruby, sapphire, emerald, emerald green, aquamarine, pink, sapphire light. Dr. Gowds Dental clinic offers you specialised, tested, and authentic tooth accessories. 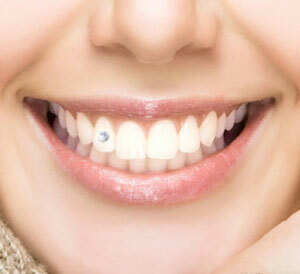 You can choose as per your wish and get your tooth jewellery mounted to sparkle up your smiles!